ARDEN’S CHOICE qualified for the rich Nevele R Three-Year-Old Fillies Series Final at Addington in the autumn when she ran second in a heat at Alexandra Park on 12 February. For the first time in her race career, the Panspacificflight filly was pushed hard out of the gate, driver Zac Butcher wanting to take advantage of her No. 1 draw in the 1700-metre sprint. Bettor Think Quick came up the passing lane to claim her in the straight, running a time of 2:03.6 with the last half in 56.4 and the final quarter in 27.3. This was Arden’s Choice’s first start for trainer Barry Purdon stable after previously being in the All Stars Stable in Canterbury. Her next big target is the Group I Pascoes Northern Oaks, worth $125,000, at Alexandra Park on 04 March. But she races again at the park on Friday night. Also in action there are two Panspacificflight four-year-olds, Little Rascal, the track specialist, and In Full Flight, who ran a promising first-up second on 05 February. It’s taking a while, but In Full Flight is the horse that will probably give Panspacificflight a winning percentage of better than 50 per cent from his first crop. Arden’s Concord, who has gone on to win three times, became his 11th winner from 23 live foals back in August. In Full Flight would be the 12th. MACCA LODGE’S Caine McIntyre has a good one in The Honey Badger who is down to start in this weekend’s Group III $25,000 Alabar Kindergarten Stakes at Wyndham after an impressive debut on the same track earlier in the month. Caine races the Somebeachsomewhere gelding with his brother-in-law Paul Hailes, of Balfour. The Honey Badger smashed the track record for two-year-old colts and geldings over 2400 metres (mobile) by more than six seconds when he posted 2:59.5 in downing a maiden field on 08 February. THB provided Macca Lodge trainer Tony Stratford with his 11th win of the season. He has also entered Mach Three filly Jody Direen for the Kindergarten. Tony has won the race previously with Le Sol in 2010. The competition will be tough, though, with the Purdon and Rasmussen team entering three runners, including the Sapling Stakes winner Pacing Major. Paul’s having a wonderful trot as a breeder this season. On the same day that The Honey Badger won, his half-sister Glenburn Joy (by American Ideal) also won very impressively on debut in track record time for a three-year-old filly. They’re out of the Live Or Die mare Glenburn Jewel, who’s a half-sister to the Hailes family’s big winner Chesterton and Novena Rose, another American Ideal filly that Paul and wife Lauren sold for big money to Australia this season. PANSPACIFICFLIGHT three-year-old filly Julia Lady’s overdue success on the grass at Rangiora on 08 February continues her sire’s good run with Holmes Hanover mares. Four Holmes Hanover mares were covered by Panspacificflight in his first season here — and two of the progeny have gone on to become multiple winners: Glenisla (out of Touche Franco), formerly trained at Ardmore by Tony Herlihy, has won seven races in Australia and taken a mile rate of 1:55.5; and Wick (out of On The Double) has won five times for Wyndham trainer Brendon McLellan. The four-year-old gelding’s latest win came in a C2-C3 mobile over 2400 metres at Winton on 05 February. 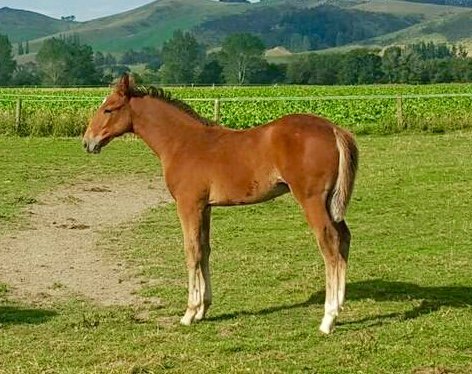 Julia Lady, bred by former Harness Racing New Zealand chairman Max Bowden and his wife Frances, is out of Precocious Arden, one of only two Holmes Hanover mares to produce a live foal to Panspacificflight in his second New Zealand crop. After racing without much luck for three seconds and a third on grass tracks, Julia Lady was at false odds of six to one when she scooted up the passing lane for her maiden win. She’s Panspacificflight’s seventh individual winner here this season. And in New South Wales four-year-old Panspacificflight mare Last Flight In scored in 1:56.7 at Newcastle. That was her seventh win, matching Glenisla’s record for the most number of wins down under by the stock of her sire. BRENT, CAINE, TONY and the team at Macca Lodge handle a host of young horses each year that go on to make fine racehorses. One of the latest is the four-year-old American Ideal gelding American Spirit. He won his first two starts for Mosgiel trainer Darryn Simpson and added a third win on the grass at Waikouaiti on 07 February.